On the road to somewhere: Buy me some peanuts and crackerjacks..
Buy me some peanuts and crackerjacks..
Today is opening day of Royals Baseball. I love baseball season. I did not really pay attention to baseball until I was married, never followed a team until we moved to the KC area. Sure the Royals are not the best team. Sure it is hard to listen to them lose game after game (at least for the last couple of years). But I love listening to the Royals Radio Broadcast with Denny Matthews and Ryan LaFever (I am not sure on the spelling of Ryan's last name). We don't have cable, so we rarely watch the Royals on TV. For me baseball is all about listening on the radio. To today's game is on the local broadcast, so we are going to watch baseball today. There is one small annoying thing about the radio broadcast. The KC station (AM 810) plays all of the Royals games while the Lawrence Station (AM 1320) plays most of the games, but will preempt the Royals for KU baseball. 810 claims to be the most powerful sports station in the Midwest. Well they should revise that statement - they are the most powerful station in the Midwest until 8pm, at which time there signal gets weaker and we can barely get the station in. I don't understand. We only live about 40 miles from KC. The prospect for the Royals is better this year. A new GM who has made some changes. Hopefully the changes to the pitching staff will be enough. Now I just need to decide if I am going to attend the Royals "Stitch and Pitch" Game. In like a lion, out like a _________. March here started with a roar. The saying goes in like a lion, out like a lamb. Well not here in Lawrence. March 31st was a windy, cold day. Definitely out like a lion, with wind gusts up to 48 miles per hour. We walked downtown to drop off some mail. It looked nice a sunny outside. But boy were we fooled. We shivered our way downtown and visited a couple of shops, including the Yarn Barn. Then we shivered our way home. I did see a couple of new stencil graffiti. and in skeins drying out. The best part - my husband wanted me to teach him how to spin. His first attempts (using wool, not silk) were pretty good for a beginner, though we would not believe me. I wish I still had my first skein of yarn I spun to show him in comparison. 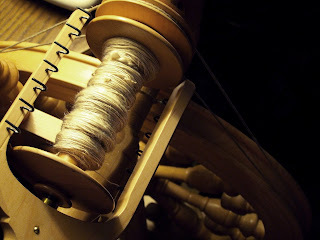 He really likes the treadling part, so for a while, he treadled while I spun the yarn. It was a really fun way for us to share my love of fiber. Now if he would just let me teach him how to knit. One last bit of excitement - we finally have birds coming to our birdfeeder. When we moved in to our current place in August, some friends gave us this bird feeder. We are just now getting birds coming. I really don't consider myself a baseball fan (don't follow the game, don't particularly follow any teams) but there is something so soothing to me about listening to a game on the radio. I often put the Rangers games on if I'm home in the afternoon and just have them as background while I grade or sew or clean or whatever. After Sept. 11, 2001, being able to listen to baseball in the evenings was one of the sanity-saving things for me: one of the things that reminded me that life was still mostly normal and that there were still good things from "before." No way. A stitch & pitch game? Maybe that requires a Knit Lawrence field trip! Royals win! Yea! Jeff was paying attention and getting excited about opening day. Elinor and Jennifer-- are you aware that you've met each other? Most likely at the tapas, a ground hog or a peony party. SS - Well, I have been going to the knit lawrence meet-ups so I have meet Elinor there, but I could believe that we had met previously at one of your parties. I did not see anything about it on the Royals site. For the record, it's Ryan Lefebvre. I always preferred Denny and Fred (White), but Ryan is growing on me. The Royals should be pretty good offensively, but may have terrible pitching and defense. But Meche looked great and if Greinke comes through, the pitching might at least be tolerable. I was pretty certain I was spelling Ryan's name wrong, but I did not have time to look up the correct spelling - Thanks for the correction. I was not a listener when it was Fred and Denny, so I don't know what I was missing. But I just love how Ryan and Denny go off on random stuff at times. For example - they always provide a running commentary on any marriage proposals. We may be in Lawrence on June 9 for a wedding. I might have to try and promote staying for stitch and pitch.